Premier Mirrors > Glow Touch Sensor LED Bathroom Mirror (400x700). Glow touch sensor LED bathroom mirror. Film backed mirror for added safety (safety glass). Mirror size: 400W x 45D x 700H mm. Can be fitted within 0.6 meters of a basin or similar water source. BS7671 compliant and suitable for zone 2. 12 Month guarantee: Premier guarantee this bathroom mirror for 12 months. 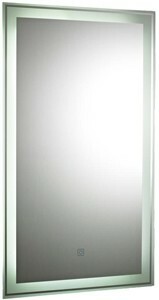 Premier's Mirror range offers choices of backlit, colour changing and LED lighting.